It’s a sad fact that the nutritional quality of our food is declining. The main reason for this is the depletion of essential minerals in our soil. Modern intensive agricultural methods have left our soil mineral poor and this, in turn, impacts the food we grows and eat. This is not new information and yet, it seems, every time we are confronted with it we treat it as if it were. In 1940, British chemists Robert McCance and Elsie Widdowson published the first of what would be their periodical examinations of the nutrient content of food: The Composition of Food. When the fifth edition of this impressive tome – which has over the years become a standard reference work on the subject – was published in 1991, a British geologist-turned-nutritionist David Thomas undertook the work of comparing the values as published in the first and last editions of the book. Among the other worrying findings was that seeding the soil with only certain minerals (sodium, phosphorus and potassium) has greatly altered the natural mineral profile of our foods. Thus, swedes now contain 110% of the phosphorus they once did. Humans who eat this nutritionally altered food cannot help but experience an alteration in the natural mineral profiles of their body tissues and bones as well. A similar exercise was carried out in the US in 1999 when nutritionist Alex Jack compared nutrient values in the current US Department of Agriculture (USDA) handbook with those published in 1975. He discovered a number of mineral deficits as well as the fact that cauliflower had 40% less vitamin C than it did in 1975. Other analyses have found the same declines in the nutrient quality of fresh fruits and vegetables. For instance, a similar study of British nutrient data from 1930 to 1980, published in the British Food Journal found that in 20 vegetables the average calcium content had declined 19%; iron 22%; and potassium 14%. A major study on the topic by Donald Davis and his team of researchers from the University of Texas (UT) at Austin’s Department of Chemistry and Biochemistry was published in December 2004 in the Journal of the American College of Nutrition. 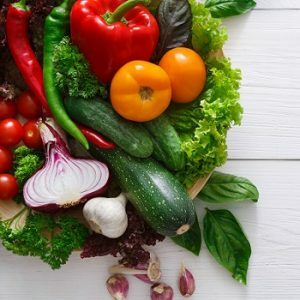 They studied USDA nutritional data from both 1950 and 1999 for 43 different vegetables and fruits, finding “reliable declines” in the amount of protein, calcium, phosphorus, iron, riboflavin (vitamin B2) and vitamin C over the past half century. There have likely been declines in other nutrients such as magnesium, zinc and vitamins B-6 and E, but they were not studied in 1950 and more research is needed to find out how much less we are getting of these key vitamins and minerals. In 2011, Davis and his team again compared the nutrients in US crops from 1950 and 2009, and found notable declines in five nutrients in various fruits, including tomatoes, eggplants and squash. Most recently the magazine New Scientist published a special report also suggesting that food is getting less nutritious, and highlighting reasons why this might be. It points out that intensive farming methods, which were introduced in order to solve malnutrition, may have affected the vitamins and mineral contents of foods: a 43% decrease in iron and a 12% decrease in calcium in US foods in 2009, compared with 1950; and a 15% decrease in vitamin C and 38% decrease in vitamin B2 between 1950 and 1999. Data for fruits and vegetables grown in the UK were found to have 19% less calcium and 22% less iron in the 1980s, compared with the 1930s. The New Scientist article suggests that today there is a wider range of foods available today, which could make up for deficiencies in individual foods. The way we store and process foods can also make them more or less nutritious. For instance, during processing, some foods can lose nutrients, whereas peas retain their vitamin C if frozen soon after harvesting, and tomatoes increase their lycopene (an antioxidant with potential anticancer properties) during processing. While true it is very much tinkering at the edges of the nutrient question. The key to healthier produce is healthier soil. Alternating fields between growing seasons to give land time to restore would be one important step. Another key is to reduce our use of pesticides. Many classes of herbicide can alter plant metabolism and, thus, nutrient composition. For example, herbicides that inhibit photosynthesis (such as triazine or phenoyacetics) produce effects similar to growing a plant in low-light conditions. Under such conditions, the carbohydrate, alpha-tocopherol (vitamin E) and beta-carotene (a precursor of vitamin A) content of a plant is reduced, and protein, free amino acid and nitrate levels are increased. Equally, bleaching herbicides can reduce beta-carotene levels, and sulphonylurea herbicides are known to reduce levels of branched-chain amino acids (which humans need to maintain muscle tissue). Fruits and vegetables are still great sources of nutrients and beneficial phytochemicals which you can’t get in other foods and we certainly should not be avoiding them or simply trying to replace them with supplements. As consumers we can choose to buy foods from producers who take care of their soils and pay attention to producing nutrient dense foods. We can, for example, buy regularly from organic farmers and/pr from local producers who shorten the food supply chain and thereby help to deliver fresh foods with more nutrients. But we do need to recognise that nutrient declines are symptomatic of other problems within our farming and food systems. And these will only get bigger if we don’t demand that they are urgently addressed in a much broader way at government, policy and farm level. 2015 was declared the International Year of Soils by the UN Food and Agriculture Organization. You can read more about the importance of soil here.